Did you used to read the old comic strip – Calvin and Hobbes? Oh the stuff Calvin would conjure up and Hobbes there, right by his side – his wing man, tag-a-long and many times devil’s advocate making Calvin reconsider things. Oh – I just loved it. The other day, I saw the documentary Dear Mr. Watterson. It is a tribute to the “the best comic strip in the history of the universe”. And you know – many people say that is so true. The documentary talks about the uniqueness of the strip, the originality of the story line, the dad. It shares stories of young boys who didn’t fit in, weren’t doing well in school – yet found solace in reading Calvin and Hobbes collections. It talks about how Mr. Watterson, the creator of the strip wouldn’t sell his line to create merchandise or give the rights to cartoon makers or advertisers to use Calvin and Hobbes to sell their products. The film addresses the frustration that the fans felt and still feel around that. That once Bill Watterson decided to quit the strip, he did just that. He didn’t sell the rights to anyone – and now he is nowhere to be found, won’t do interviews and Calvin and Hobbes only lives in our memories and in our collection books. It both infuriates me and gives me deep respect for his choice to handle his success the way he did. I, like many, want more. I want to see Calvin and Hobbes on TV. Wouldn’t it have been great to watch the duo on Saturday mornings – right after Looney Tunes but before Scooby Doo? But I also have a deep respect for Bill Watterson holding true to his convictions. He didn’t want to commercialize his comic. He didn’t want to see Calvin selling Met Life Insurance. He just wanted to share this little boy’s story. And when he was done – he was done. 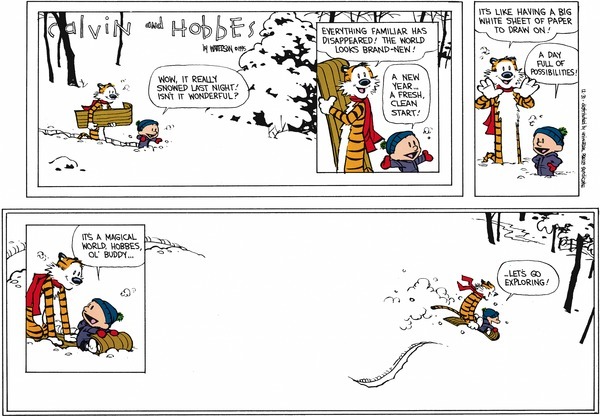 This is the final strip that Mr. Watterson gave us of Calvin and Hobbes – printed on Dec 31, 1995. Wile I didn’t want the comic strip to end, I like how he did it. There is so much he is saying these four blocks. On Easter night, I got to thinking of this documentary again while I was watching the Charlie Brown Easter special with my boys. I used to love the Charlie Brown specials. My boys don’t love them as much – they aren’t very action filled, they don’t have a ton of color – they mostly talk. 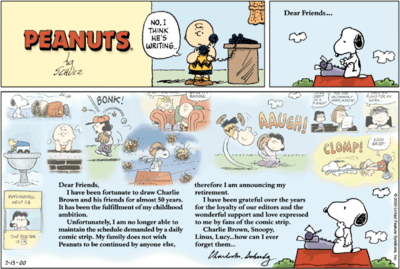 I feel a little disappointed with Charles Schultz’s last comic strip for the Charlie Brown series. Over 50 years and 18.000 strips drawn, Schultz called it quits and on Feb 13, 2000 – the day after Schultz died, Peanuts ran for the final time. I didn’t love the ending of Peanuts. I sooo wanted it to be a two panel strip – – Lucy holding that football and Charlie Brown finally – finally – kicking it…and a huge smile finishing the legacy. Alas – Mr. Schultz didn’t ask for my input and here is his final strip. It’s frustrating isn’t it. No one liked how MASH ended. Did anyone like Seinfeld’s ending? I have to admit, I thought Three’s Company and Happy Days ended sweetly. Did the seven cast-a-ways ever get rescued? I respect the creators of these shows and books and comic strips for putting themselves out there and letting us love them. It must be hard to stay true to your values when your fans what something else from you. And is it really that we don’t like the ending they chose or that we just don’t want it to end? What do you think? What is your favorite – worst ending? Categories: Just for fun, Random Thoughts | Tags: bill watterson, Calvin, calvin and hobbes, charles schultz, charlie brown, comic strip, comic strips, Hobbes, let's go exploring, peanuts, Scooby Doo, Seinfeld | Permalink. Have you experienced your head spinning with ideas and things to do. Try a brain dump and get them out of your head and onto paper. It will clear your mind and allow you to concentrate on the task at hand. 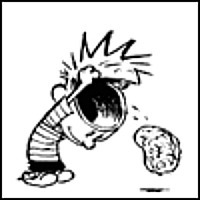 Categories: 28 Days - Reducing Distractions | Tags: brain dump, calvin and hobbes, reducing distractions | Permalink.